Lawyer says client will cooperate with special counsel Robert Mueller. A U.S.-based employee of a Russian real estate company took part in a June 2016 Trump Tower meeting between a Russian lawyer and Donald Trump Jr., bringing to eight the number of known participants at the session that has emerged as a key focus of the investigation of the Trump campaign&apos;s interactions with Russians. Ike Kaveladze attended the meeting as a representative of Aras and Emin Agalarov, the father-and-son Russian developers who hosted the Trump-owned Miss Universe pageant in Moscow in 2013, according to Scott Balber, an attorney for the Agalarovs who said he also represents Kaveladze. Balber said Tuesday that he had received a phone call over the weekend from a representative of special counsel Robert S. Mueller III asking if Kaveladze would agree to be interviewed. Balber said his client would cooperate. The request is the first public indication that Mueller&apos;s team is investigating the meeting. The presence of Kaveladze at the Trump Tower meeting introduces a new and intriguing figure into the increasingly complex Trump-Russia drama. A native of the Soviet republic of Georgia who came to the United States in 1991, Kaveladze was the subject nearly two decades ago of a congressional inquiry into Russian money laundering in U.S. banks, although he was never charged with a crime and Balber said there was never any sign of wrongdoing by Kaveladze. The emergence of new information on Tuesday - some 10 days after the Trump Tower meeting was first reported - underscored how details of the session have been slow to emerge amid incomplete and potentially misleading explanations from Trump Jr.
After the New York Times first reported the meeting, Trump Jr. said only that the lawyer had primarily discussed the adoption of Russian children by Americans. More information about the meeting and its participants has emerged since July 11, when Trump Jr. said he wished to be "transparent" and released emails dating to June 2016 between himself and Rob Goldstone, a music promoter who represented Emin Agalarov, a Russian pop singer, setting up the meeting. Those emails revealed that Trump Jr. had agreed to meet with the Russian lawyer on the promise that he would be provided damaging information about Democratic candidate Hillary Clinton as part of a Russian government effort to help his father&apos;s presidential campaign, according to emails released by Trump Jr. last week. Trump Jr.&apos;s acknowledgment of the meeting undercut months of denials from top Trump aides that campaign officials had any contact with Russians before the November election. The meeting brought together then-candidate Donald Trump&apos;s innermost circle, including son-in-law Jared Kushner and top campaign adviser Paul Manafort, as well as a Russian and Russian Americans with deep ties to Trump&apos;s business and the priorities of the Russian government. Goldstone, the music promoter, told The Washington Post that he also attended. The Russian lawyer, Natalia Veselnitskaya, was leading an effort to get Congress to lift sanctions imposed in 2012 to punish Russia for human rights abuses, a topic of deep importance to the Russian government. Angered over the law, called the Magnitsky Act, Russia had put a hold on adoptions of children by U.S. families. Also present at the meeting was Rinat Akhmetshin, a Soviet army veteran whose military service in the 1980s came in a unit whose responsibilities included counterintelligence. Now a Russian American lobbyist, he has earned a reputation as a savvy political operator, at times boosting the reputation of his clients by sullying the reputations of their enemies. He has denied working for the Russian government or intelligence services. Kaveladze came to the meeting as a representative of the Agalarov family, business associates and friends of Donald Trump and his children who were also a key tie between the Trump family and Russia in the years before Trump began his campaign. Trump and Aras Agalarov had discussed building a Trump Tower in Moscow, but plans fizzled after Western sanctions were imposed in 2014 and the Russian economy tanked, the elder Agalarov told The Post last year. Alan Futerfas, Trump Jr.&apos;s attorney, did not respond to requests for comment Tuesday about the presence of Kaveladze, nor did a spokesman for Kushner. An attorney for Manafort declined to comment. Kaveladze works as a vice president focusing on real estate and finance for the Agalarovs&apos; company, the Crocus Group, Balber said. Balber said that Aras Agalarov asked Kaveladze to attend on his behalf. Kaveladze is a U.S. citizen and has lived in this country for many years, according to Balber. Balber said Kaveladze believed he would act as a translator but arrived to discover that Veselnitskaya had brought her own translator, a former State Department employee named Anatoli Samochornov. Samochornov declined to comment, citing a nondisclosure agreement he signed as a professional translator. Balber said he believes eight people attended the meeting and the names of each participant is now known to the public. Balber said Kaveladze recalls the meeting lasted about 30 minutes and mostly involved discussion of the 2012 sanctions law. In attending the meeting, Kaveladze brought a history of controversy. In 2000, his actions as the head of a Delaware company called International Business Creations were the subject of a congressional investigation into how Russians and other foreigners were able to launder large amounts of money through U.S. banks. The Government Accountability Office report, which had been requested by then-Sen. Carl Levin (D-Mich.), concluded that it was "relatively easy" for these foreigners to use shell companies to open U.S. bank accounts and route hidden money through the American financial system. The report described the activities of IBC&apos;s president, who Balber confirmed was Kaveladze. Balber said Kaveladze was not charged with any crime as a result of the inquiry, which he said was largely focused on the internal procedures of U.S. banks. "There has never been any indication that he did anything wrong," Balber said. "From his perspective, it was a big nothing." But Levin, who at the time was the senior Democrat on a Senate investigations subcommittee and retired in 2014, issued a statement Tuesday calling Kaveladze a "poster child" of the practice of using shell companies to launder funds and that the inquiry helped spark reforms. "Kaveladze&apos;s conduct helped us reinvigorate the requirement that banks know the true owner of their accounts, a policy that hadn&apos;t been enforced over the years," Levin said. According to the GAO, Kaveladze opened 236 bank accounts in the United States for corporations formed in Delaware on behalf of mostly Russian brokers. The GAO report said that Kaveladze had told officers of two U.S. banks that he had conducted investigations of the Russian companies for which he opened accounts - but that he acknowledged to GAO investigators that he had not been truthful. "He admitted to us that he made such representations to the banks but that he in fact had not investigated the companies," the report said. All told, the report traced the movement of $1.4 billion in wire-transfer transactions deposited into 236 accounts opened at the two banks, Citibank and Commercial Bank. What exactly was discussed at the 2016 Trump Tower meeting remains unclear. Akhmetshin, the Soviet army veteran who attended, told The Post last week that Veselnitskaya, the Russian lawyer, spent a portion of the meeting describing what she felt could be "a great campaign issue" for the Trumps - allegations of Russian tax improprieties by a U.S. venture capital firm whose executives were political donors. One of them had donated to the Clinton Global Initiative, an arm of the foundation established by former president Bill Clinton that became a target for Republicans who accused the Clintons of rewarding donors with political favors. Akhmetshin said that Veselnitskaya left behind a document with the Trump associates describing the allegations. "It was corporate stuff - lawyerly stuff," Akhmetshin said. The venture capital firm, Ziff Brothers Investments, had a financial stake in Hermitage Capital, whose chief executive became the leading global advocate of the Magnitsky Act, which was named for a former Hermitage auditor who died in a Russian jail under suspicious circumstances. A spokesman for Ziff Brothers Investments, Michael Freitag, declined to comment. 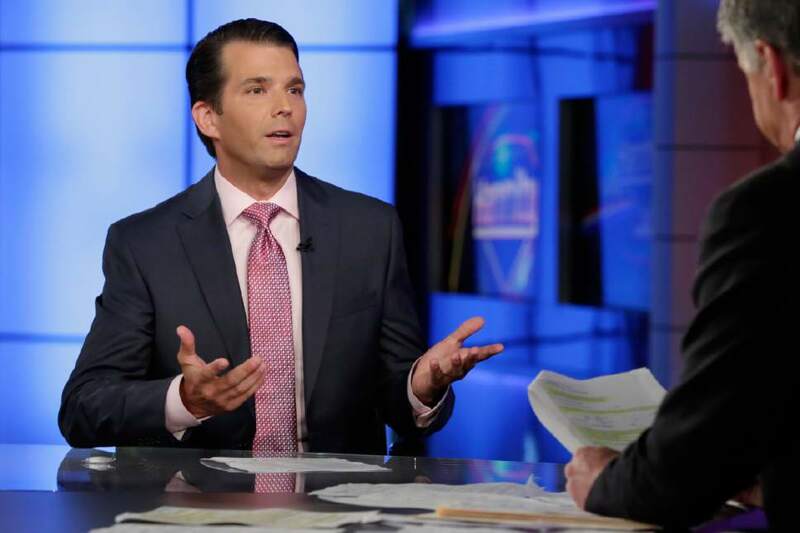 Trump Jr. has said Veselnitskaya&apos;s information was "vague" and "made no sense," and he decided the offer of damaging information about Democrats was a pretense to secure the meeting to discuss sanctions.